Kahlen is a Siren - bound to serve the ocean by using her voice to lure humans to their deaths at sea. A single word from Kahlen can kill, but she can't resist spending her days on land, wishing she could speak and live freely among ordinary people. Akinli is Human - a kind, handsome boy who's everything Kahlen's ever dreamed of. And though she can't talk to him, they begin to form a connection Kahlen doesn't want to ignore. Falling in Love with a human breaks all the Ocean's rules. But for the first time in a lifetime of following the rules, Kahlen is determined to follow her heart. So yeah, this is a romance book. But it's actually REALLY different than Kiera Cass's other romances (The Selection). This one is soooo sweet! And the way Kahlen and Akinli fall in love is amazing! I think that this is a very good light to put romance in. Yes, it is insta-love, but to be honest, it's bearable because Kahlen and Akinli don't actually spend a lot of the book together. Like I said, it's a great light to put relationships in, because (in my opinion) it shows that if you really love someone, you'll be willing to do everything for them. And this leads us to another point, the romance in here isn't only a romantic romance, it also has a "family" romance. Now that I think about it, this book is more about how "families" (putting it in quotes because they aren't technically a family) love each other. I really liked how Kahlen and her "sisters" cared for one another. Yes, they fight, but that's what all sisters do (trust me, I have a few younger sisters). CAN I PLEASE HAVE AN AKINLI IN MY LIFE??? He was soooooooooooooooooooooooooooooo sweet! And he wasn't one of those guys that was clearly bad for the girl, he was an actual GOOD guy. And he felt so REAL. Like, not one of those perfectly perfect guys, but he was a GOOD guy that seemed like you could meet someone like him in real life. The plot was excellent! It had some plot turns that I wasn't expecting. To be honest though, I kind of expect the thing at the end **SPOILER** where we find out that Kahlen's and Akinli's disease are linked **END SPOILER** But not fully. And the ending is really good! I really like Kiera Cass's writing style. Oof, I have to admit it, as much as I loved the Mother-Daughter relationship between The Ocean and Kahlen, she (the Ocean) really got on my nerves, especially at the end. I also really didn't like Padma. And what was that whole plot with her and her dad???? Like, okay, it didn't really seem to fit in. She was sooo whiny, and I sort of understand that yeah, she's been through a traumatic experience BUT YOUR DAD CAN'T GET YOU ANYMORE. Elizabeth and Miaka also irked me sometimes but that's just me being peevish. The book also says a couple of times how the Siren's beauty "attracts men" and they go to a club and a guy is clearly attract to Kahlen in the wrong way but Akinli (*dies*) saves her. Elizabeth is also said to have relationships with men. But nothing is detailed. Padma is abused by her father who tried to kill her, but, again, not very detailed. The storyline is also a little weird I guess...Like the Siren's have to sing to draw people into the water so the Ocean can eat them to somehow survive?? I would recommend this book for people 13+, and not because of the content. It's such a beautiful love story and you really wouldn't get it unless you were a bit older. Have you read the Siren? Did you like it? Would you be interested in reading it? I haven't read the siren yet but I really loved Keira Cass' other books (the selection series) and this one looks pretty good as well. It is really good! 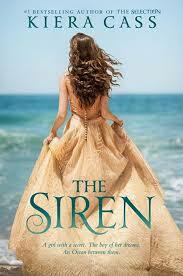 And if you liked The Selection, then you will probably like The Siren!! To be honest, I think The Siren is a lot better than the Selection. I have not seen her YouTube channel!! !